What Kind of Care Can You Expect From Dr. Cornetta? 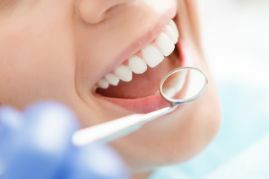 Dental visits are notoriously perceived as an unpleasant chore by most people – and can be downright scary for others! But Dr. Cornetta has set out to change that. His goal is to treat every patient with warm, personal attention and make sure they have a stress-free experience. Soft Tissue Laser – This laser makes gum treatment so comfortable that many patients don’t even need anesthesia. Significantly less discomfort and faster healing make it a win-win. Intraoral Camera – This tiny camera allows you to see up-close photographs of what’s happening in your mouth. Digital Impressions – No more messy and uncomfortable impression trays. This digital scan of your teeth and gums is faster, easier and more accurate. Digital X-rays – These X-rays use up to 90% less radiation than traditional and also result in a better image. Dr. Cornetta treats every patient like a member of his own family and only recommends treatment that’s truly necessary for their oral health. He looks forward to building many long-term relationships in the community and hopes to be the dentist that you and your family stay with for life! As a dentist in Assonet and a New England native, Dr. Derek Cornetta is thrilled about this new opportunity to provide his community with outstanding dental care. With a nearly lifelong enthusiasm for dentistry and an ongoing commitment to advanced training, he’s currently working towards a Fellowship in the Academy of General Dentistry, an achievement that only 6% of dentists earn. Dr. Cornetta is accepting new patients, so if you have any questions or would like to schedule an appointment, he can be contacted via his website or at (508) 644-5200.